Color Me Responsible: As part of their effort to support sustainable seafood, New Leaf Markets offer this color-coded guide to let buyers know how and where their fish was caught. Sometimes simple questions are the hardest to answer. If you've ever worked in a grocery or a restaurant offering seafood, then you've certainly gotten this doozy: "Is the fish fresh?" Of course it is! Would we serve it if it wasn't? But wait, what's your definition of fresh? Caught this morning? Yesterday? Caught, then immediately frozen, thawed this morning and served today? If you really enjoy seafood, want to keep eating it and want your kids' kids to experience it, an even better, harder and more relevant question should run something like, "Is this fish caught by sustainable methods that consider factors of pollution, bycatch, habitat destruction, the biological sustainability of the species and the overall health of the ocean?" Lucky for us, two Santa Cruz ocean sciences students had all of this and more on their minds when they approached New Leaf Markets in 2002 about these very issues. Just as Shelley Benoit and Theresa Ish were ready to confront New Leaf about offering unsustainable fish options like Thresher Shark, New Leaf had been spinning their wheels about how to accommodate the mounting requests from "Seafood Watch" customers asking for sustainable fish options. What resulted from their meeting was a sustainable seafood summit of sorts, in which the two parties worked together to pilot New Leaf's Sustainable Seafood Program, which launched in January of 2003. The program (now known as FishWise) is one of the first, if not the first, of its kind, and its nascent success gave Benoit and Ish the confidence to incorporate themselves as a nonprofit organization known as Sustainable Fishery Advocates (SFA) whose mission is "to educate consumers, restaurants, distributors, and retailers on sustainable fishery issues, with the goal of decreasing unsustainable fishing practices, while improving fisher livelihoods, fish populations, and ocean ecosystems." According to New Leaf sales data as of January last year, these lofty goals are creating tangible results. 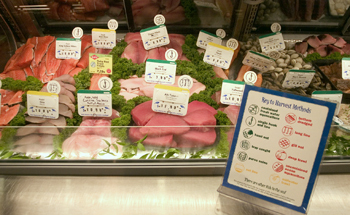 Sarah Miles, the company's marketing director, says that the program has resulted in a decrease in consumer purchases of 7,000 pounds of unsustainable seafood per year, while the percentage of unsustainable seafood across the entire chain has dropped from 22 percent to 14 percent of total seafood sales. And all of this while meat sales were up by 15 percent at all stores over the same time the year before. In Miles' opinion, even though "it is darn near impossible as a consumer or as a retailer to make 100 percent sustainable choices in every arena all the time, it is important to make those choices consciously and be educated about the impact of your purchases on the community and environment that we all share." The program follows the same green/yellow/red coding system used on the Seafood Watch cards. Green means the source is biologically sustainable and that it is caught with a method that is also sustainable. Yellow usually means that the fish is biologically sustainable but might be caught by a method that is not. Red-coded items are usually not biologically sustainable, nor are they sustainably caught or raised. Evaluating seafood sources is a constant job both for New Leaf and SFA. The store doesn't offer new choices without having SFA research them first, so when you, the busy shopper, come to the store, the work is done for you. As Benoit, SFA's executive director, tells me, "Theresa Ish [SFA's Science Director] researches all the science behind the sustainability. It is all backed by primary literature and peer-reviewed literature. We can quantify and back everything that we claim. We're both scientists and it's really important to us to make sure that we're totally accurate." SFA's model and vision push them beyond the scope of the watch-list format by researching individual producers and seafood sources in an attempt to determine the sustainability of a particular source. Benoit and Ish are taking their act on the road, so to speak, due in large part to their successful partnership with New Leaf. By early October, Good Earth Market in Fairfax, along with National Grocery in Berkeley and El Cerrito, will be online with versions of the FishWise program. And if all goes well, word has it that Capitola's Shadowbrook might be online in the coming months with their own version of the FishWise program developed in conjunction with SFA. All of these efforts, Benoit believes, have long-term solutions in mind: "The idea is not only sustainability for the fish and the ocean but for the people who are fishing. We want to support the people who are doing things in a really good way. We can find people who are doing things right and support them and we can help them get business with the idea that people will see their success and change, and then if you create enough demand maybe you can shift the focus of the industry for a longer-term solution."